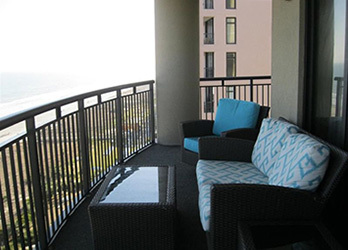 Located in the heart of the Grand Strand area of South Carolina is the small, peaceful town of Surfside Beach. This seaside community contains almost two miles of beautiful white sandy beach with a great climate and a laid-back, small-town atmosphere that has become quite popular for many vacationers. It is known as the Family Beach and strives to maintain that image by promoting a fun and friendly environment for visitors who are young or old, as well as providing a quiet haven for those seeking the ultimate in rest and relaxation. History shows that much of Surfside Beach was once known as “The Ark Plantation” and was owned by a plantation owner named John Tillman. Survey records from the early 1800s show that his land, which totaled almost 3,200 acres, stretched from the Atlantic Ocean about three miles inland and included about one and a half miles of oceanfront property. The plantation’s main crops that were grown were sweet potatoes and rice and Tillman himself was quite affluent until the Civil War when he died with not much value to his personal property or estate. In the late 1800s, the plantation then began to be developed and was known as “Roach’s Beach” for a short time. The principal industries of the time were lumber and feed for horses and mules. After changing ownership several times by the mid-1900s, the land began to develop more quickly and eventually became known as Surfside Beach. When Hurricane Hazel destroyed many of the houses in 1954, the town quickly rallied and began rebuilding and opened the first grocery store. Significant growth occurred when the Myrtle Beach Air Force Base was reactivated shortly thereafter. Since then, Surfside Beach has seen various improvements and growth and established its reputation as a family beach that has made it highly desirable for people to visit and retire. There are several fun activities to do that definitely will appeal to all visitors, especially families. The Wild Water and Wheels Park have more than thirty-three water rides, a miniature golf course and a race track facility with rides for people of all ages. This is a definite must-visit for anyone staying in Surfside Beach. Get some friendly competition on at Surfside Bowling and Billiards or Harbor Light Ball Yard and Batting Cages…definite fun for the entire family. 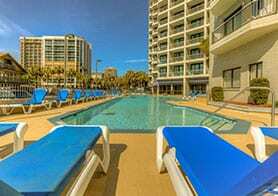 Surfside Beach is also close to some of the best attractions in Myrtle Beach, including Broadway at the Beach, the beautiful Brookgreen Gardens, and the Celebration Theatre. You won’t go hungry will all of the great choices in dining facilities in this town. Start your day with an omelet at The Golden Egg or a stack of pancakes at the Plantation Pancake House. Sample freshly caught fish and seafood or enjoy fall off the bone ribs at Bubba’s Fish Shack. Satisfy a sweet tooth at Sea Dog’s Ice Cream shop. For the adult crowd, celebrate the end of a relaxing vacation day with a drink and live entertainment at the Surfside Live lounge. All this and many more delicious culinary choices await you. In terms of shopping, there are great stores in which to find the best souvenir or gift for you or someone else. At Whales Island Shops, you’ll find a wide array of nautical gifts, vintage collectibles and much more. Beach bums can head to the Eternal Wave Surf Shop to check out surfboards, skimboards, boogie boards and clothing. Don’t forget, Surfside Beach is only a short distance away from all of the great shops that are available in Myrtle Beach so you will be certain to find some great items no matter where you go. There is so much more to see and do in Surfside Beach and once you visit, you will see why this small seaside town earned its reputation as a fun family beach. 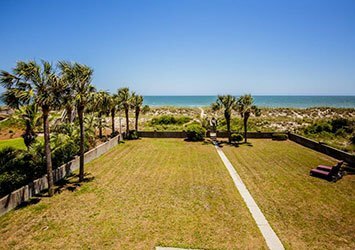 Make sure your next family vacation is to the beautiful, family-oriented town of Surfside Beach and enjoy all it has to offer.